The Phoebe nest is empty and its occupants have moved off into the trees, leaving the garden to wrens and hummingbirds. 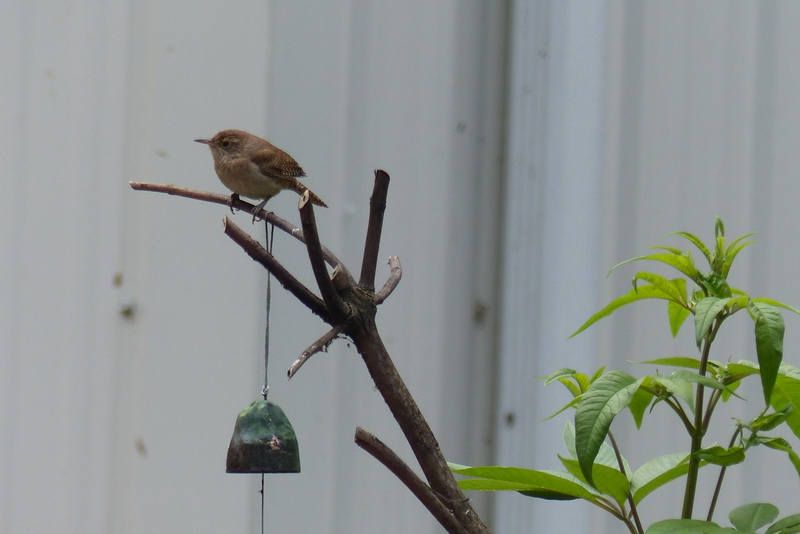 A House Wren pauses briefly in the garden. In relocating their fledged chicks to a place with more cover, the Phoebes have lifted a curtain on our surroundings, revealing activity we had barely noticed during their frenzied feeding phase. Suddenly, it seems, we are hearing and seeing afresh the chatter and flitting of House Wrens and the movements of Ruby-throated Hummingbirds, both of which seem to have claimed the territory formerly ruled by the Phoebes. 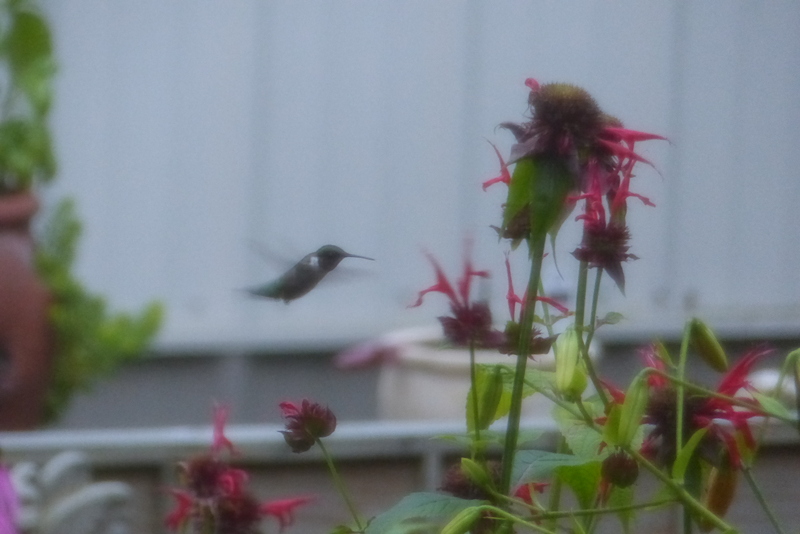 A Ruby-throated Hummingbird over the Bee Balm. Now, instead of watching the aerial feats of flycatchers, our eyes are trained on the hummingbirds feeding on Bee Balm and Salvia and the wrens busily tending their young in an assortment of dwellings. We last saw a Blue-Gray Gnatcatcher during the spring migration, so were quite pleased when this one showed up under the summer sun. We have been on the lookout, too, for birds that seemed scarce, likely because they were having their young, and now are reappearing more frequently closer to the house. Downy, Hairy, Red-bellied, and Red-headed woodpeckers and Northern Flickers have shown themselves again along with a Red-eyed Vireo and Blue-Gray Gnatcatcher we had seen earlier in the season. As in life, it seems the absence of something we had become accustomed to seeing has given us fresh eyes and ears for other things we might not have noticed in our midst, or had taken for granted. Just as the departure of a high-achieving first-born can open our hearts to the quiet beauty of a younger child who has been living in an older sibling’s shadow, so changes in our landscape have the potential to enrich our awareness and appreciation of what is around us. When we allow change to show us what is present instead of what is missing, we hear and see things that may have been obscured or drowned out by our focus on the very thing we had cherished. Just so, if we can bear to be quiet and brush away the distractions that drive our culture, perhaps we can open ourselves to receiving that which is given only in stillness. One of the last photos taken of the Phoebe chicks before their departure from the nest. 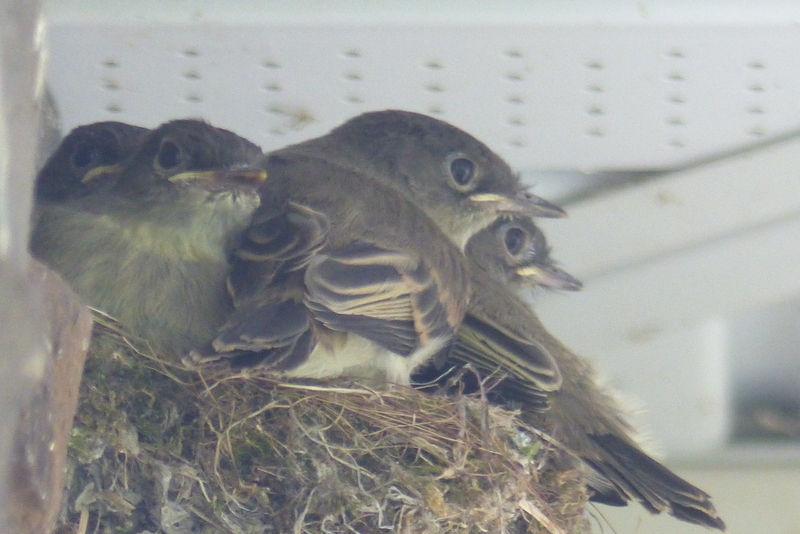 The Phoebe chicks, by the way, fledged on July 10. They were in the nest when I left that morning and gone when I returned in the afternoon. The day before, we managed to snap a few last photos of them in the nest. For days afterward, we saw nothing more than one adult, but my husband has since discovered them in an area of pine trees on the edge of the woods. With a change of season approaching, we know it won’t be long before they will be moving on, along with the other migratory birds who have been with us in the spring and summer. When they leave, another curtain will be pulled back on a garden fading into fall, revealing a new landscape. May we look on it with eyes that are open to seeing its gifts instead of longing for what is passing. This entry was posted in contemplative living and tagged change of seasons, Empty nest, end of summer, flycatchers., Hummingbirds, migratory birds, Phoebe, seeing with fresh eyes, wrens. Bookmark the permalink. I always learn something new about birds, nature or life in general when I read and savor your posts. Those little phoebes are so sweet. I especially appreciated your thoughts on quiet and stillness–just what I needed to hear right now. Many thanks! Thank you, Joan! May we continue to learn together about birds, nature, and life in general — and most especially about quiet and stillness. … and as we grow older, pray God that we continue to look forward with our God-given eyes focused on Heaven instead of lamenting that the good times of life on earth are passing. Thanks for elaborating so beautifully on this post, Sherm. Wonderful comment. So good to hear from you, Pearl, and thank you for such a nice and affirming comment! Wow…exactly what I needed to hear this morning:-) Thank you for your special, gentle way of helping to open hearts, eyes, and ears. And your comment is exactly what I needed to hear this morning! Thanks for the encouraging and timely words!